When kate spade looked to expand beyond its handbag business five years ago, its team went on a brand-and-soul-searching exercise. As CMO and SVP Mary Beech noted, they already knew the demos for their target audience, but those weren’t enlightening enough. After an extensive brand audit, they arrived at their current positioning: kate spade inspires you to lead a more interesting life. On Tuesday, Beech spoke at the Brite ‘14 Conference, hosted by Columbia Business School’s Center for Global Brand Leadership in New York. She discussed how kate spade’s voice reflects its customers’ lifestyles and how it’s been integrated into digital platforms, employees’ mindsets and in-store experiences. Brand voice and guidelines: For kate spade, becoming more familiar with their consumers meant a 360 degree understanding of their preferences, such as books and hotels, as well as celebrating customers’ sense of humor. They now define the ideal customer’s personality as culturally curious, quick, playful, spirited and chic. However, while conducting further brand research, they found they weren’t always delivering. Beech acknowledged that the message was sometimes too bold, or more silly than witty. So they created a set of guidelines: re-imagined, not retro; clever, not cliché; bold, not bananas. These help the brand to be more consistent and accountable. Last fall consumers publicly took the brand to task in response to a canvas tote simply meant to signify “I heart kate spade”. However the logo carried an unintended interpretation. Social media reacted negatively, and the brand quickly removed the controversial items. 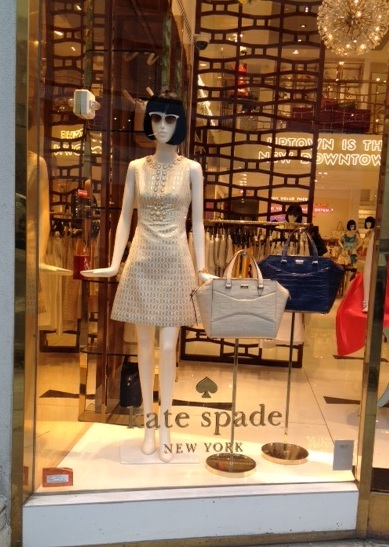 Employee buy-in: “2 Park Avenue is so kate spade”, Beech said. Their HQ is a happy place where they serve employees cupcakes and champagne on occasion. “We need everyone to tell the kate spade story; it can’t just come from us”, she added. The kate spade outlook extends to its sales associates, she explained. They have an in-store education team to train sales staff to properly use, but not overdo, the brand voice. Training tools include videos and a brand book labeled “Hello Sunshine”. Online and social communications: “Social media is a great platform for our brand voice”, Beech said, and she outlined their digital efforts. The brand had an early presence on Pinterest, and now it’s become a new product development platform. Instagram illustrates glimpses behind-the-scenes. On Facebook they use the ecommerce feature, and their Twitter messages focus mainly on the kate spade lifestyle. Digital and interactive storefront: “Digital is our true flagship since ecommerce drives engagement”, said Beech. The brand also pioneered an interactive storefront last spring. Their (younger, more affordable) kate spade saturday line temporarily located in vacant store windows in NYC’s Chelsea area. Using mobile devices, window shoppers were able to order items on eBay and have them delivered. “This was very successful from a PR perspective”, she reported. 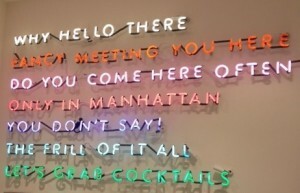 Evolving retail design and our NYC flagship store field trip: “Our stores were like visiting a friend’s apartment”, Beech said. But the team found they didn’t project enough brand voice. She said they’ve been refining and retrofitting their stores accordingly. For example, they know customers take in-store selfies, so their dressing rooms now feature stylish wallpaper to serve as photo backdrops. 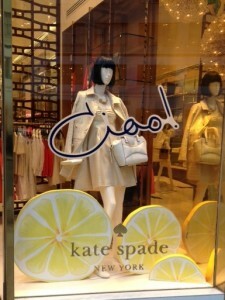 Beech’s presentation piqued our curiosity, so we stopped by kate spade’s flagship Madison Avenue store. Our visit turned out to be spot-on in terms of delivering the brand promise, and our take on the experience: colorful, welcoming, multicultural, upbeat and whimsical. Since this month’s design theme is the isle of Capri off Italy’s Amalfi coast, windows greet customers with “Ciao” and the bright color scheme reflects the Mediterranean. 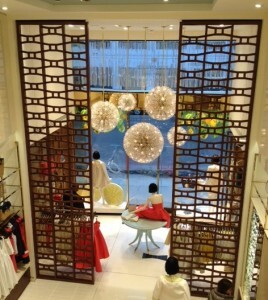 Sales associates were extremely cordial, allowing for browsing, (unlike some other Madison Avenue stores). Asian customers were taking photos, and the dressing room wallpaper (left) was worth photographing.